Ervin Epstein, MD, joined CHORI in May, 2007 after 35 years at UCSF. He graduated from Harvard College, UCSF Medical School, and received his subsequent clinical dermatology and research training at Washington University of St Louis, Harvard, New York University, and the National Institutes of Health. Since 1972 he has divided his time between independent private practice of Dermatology in Oakland and Lafayette and independent research into the molecular bases of skin diseases. He has authored more than 100 published papers and, among other organizational posts, has been the President of the Society for Investigative Dermatology, the world’s largest organization devoted to investigation of the skin and its diseases. 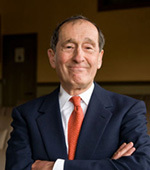 He has delivered numerous named award lectureships including those honoring Sulzberger (the American Academy of Dermatology) and Dohi (the Japanese Dermatologic Association) and has been the recipient of Lifetime Achievement Awards from the American Skin Association in 2005 and from the Society for Investigative Dermatology in 2015. His current NIH-funded research focuses on non-melanoma skin cancers, in particular the commonest human cancer – basal cell carcinomas. He and others identified a crucial molecular abnormality driving the development and maintenance of these tumors two decades ago and his efforts subsequently have focused on adopting this new information into therapies that someday might make surgical extirpation obsolete (JY Tang et al New Eng J med 366: 2180-8, 2012; JY Tang et al Lancet Oncol 17: 1720-31, 2016). In addition, his lab is investigating the cell of origin of these tumors GY Wang et al Cancer Cell 19: 114-24, 2011) and the molecular underpinnings of the ir tumorigenesis (GY Wang et al, Oncogene 2017).